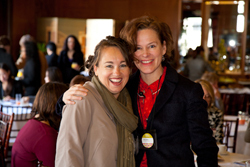 Over 225 women and men are expected to attend EWIP’s Women’s Leadership Conference and Awards Luncheon on Wednesday, March 7, 2012. 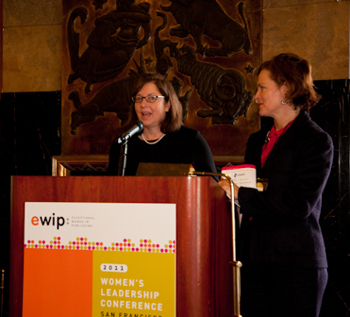 This is the fourth year EWIP has held the annual conference and award presentation in San Francisco. In recognition of the success of the event, EWIP received a thank you letter from Democratic Leader, Nancy Pelosi who extends a warm welcome to all participants. In her letter she recognizes the value of those working to help women become strong leaders and applauds the group for providing “examples of great partnerships and collaborations, and [providing attendees with] opportunities to interact with innovative leaders” in publishing and media. There are over 30 speakers in the all-female roster who will speak to the theme, Taking Our Next Step: Content, Community, Collaboration in the highly interactive conference. A highlight of the Women’s Leadership Conference is the Exceptional Woman in Publishing Award presentation, an opportunity to publicly honor an influential leader. Michela O’Connor Abrams, president of Dwell Media is the 2012 Exceptional Woman in Publishing Award recipient and will be honored during the March 7th luncheon. Sponsors for the 2012 Conference include, Brown Printing Company, Dwell Media, Graphic Communications, Infogroup, PM Digital, Publishers Press, RR Donnelley, The Magazine Manager, Time/Warner Retail, Verified Audit, and Zinio. Tickets for the nearly sold-out event are available online till 8:00 pm PST on Tuesday. For more details on the conference program, session schedule visit the registration site online. I simply want to say I’m very new to weblog and definitely enjoyed your web site. Very likely Iâ€™m going to bookmark your blog . You definitely come with amazing articles. Appreciate it for sharing your blog.